They burrow at our riverbanks, bully our crayfish, and hide their mischief behind cute furry cuffs. 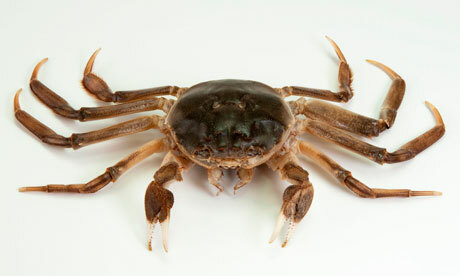 The Chinese mitten crab has long been a scourge of our waterways, clogging drainage systems and flood defences. Capable of travelling hundreds of kilometres up rivers and across dry land, they have even been spotted scampering down high streets. One proposed solution to this crustacean curse was to eat our way through them. Mitten crabs are prized in Asia for their tasty sexual organs, and Gordon Ramsay has sung the praises of their sweet, intense flavour. But for some reason, crab gonads never caught on in the UK restaurant scene. Now, a different solution might be at hand: young designer Jeongwon Ji has used their shells to make a new form of plastic. Working with a science student at Imperial College – next door to Ji’s own base at the Royal College of Art – she had the chitin extracted at a lab before testing it in different combinations with red algae and glycerine to form a gelatinous paste. Pressed into wooden moulds and left to dry, it formed a grainy, tactile rubber. Jeongwon Ji’s electronic designs made of Chinese mitten crab bioplasticShe stands in front of a table spread with an intriguing collection of objects she has fashioned from her crabby plastic. A wonky elfin hat in olivey green teeters next to a squat black pyramid. There is a tapering coral-pink triangular block, and a warped slab that looks like an abrasive bar of soap. Everything is slightly puckered and misshapen, like leathery fruit-peel left to dry in the sun. They could be dredged from the sea bed, or talismans from a wandering alchemist – but they are in fact consumer electronic designs. 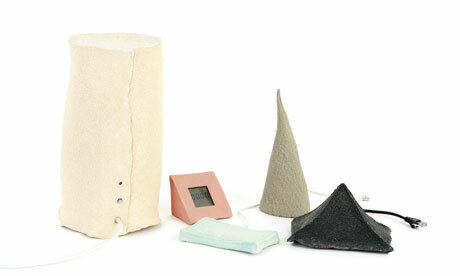 What looks like a bar of soap is in fact a computer trackpad, the olive hat is an LED torch – and the pyramid is a Wi-Fi router. They are the kind of organo-futurist products you might find if Dixon’s opened a branch on the Ewoks’ home of Endor. And they have special powers to match: a crooked cream cylinder is actually an air purifier, employing the natural antibacterial quality of chitin – which also means it is an ideal material for children’s toys of the future. Submerged in water for two weeks, her bioplastic begins to dissolve. That’s all part of the point: “It is about returning a kind of fragility to these objects – which usually only have a one or two year lifespan anyway,” says Ji. In the UK alone, we produce around five million tonnes of plastic wasteevery year – of which 75% ends up in landfill. While the percentage ofrecycling is rising, biodegradable plastic is a ballooning alternative, with global production predicted to reach over 800,000 tonnes by 2020. Although bioplastic is mainly used today in packaging and disposable cutlery, young designers are increasingly looking to it as an option for short-life consumer products. 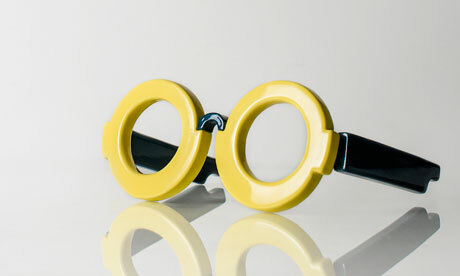 The latest must-have … Ivy Wang’s glasses made from potato bioplastic. Photograph: Matthew JosephChinese designer Ivy Wang has developed a range of accessories from potato cell walls, a by-product of biofuel production, in collaboration withProfessor Jurgen Denecke‘s research lab at Leeds University. Wang thinks she has hit on a solution. In the production of bio-ethanol from potatoes (believed to be the future source of bio-fuel over the next 20-30 years) there is 10% waste in the form of potato cell walls. At the same time, as part of an ambitious greenhouse gas reduction project, China plans to produce 12m tonnes of bio-ethanol and bio-diesel every year. The result? A mountain of waste potato, with no current use. Compressing this waste under heat and pressure, she has produced a material with the flexibility and durability of plastic – which she has cast to make glasses and other accessories. “10% waste may sound minor,” she says, “but when scaled up, it’s a vast amount.” She estimates there is around 2.5 tonnes of waste cellular wall per hectare of potatoes, so it will be an abundant material source with the potential to replace a range of synthetic plastics. So crabs and potatoes no longer means crab cakes – today it might just be the recipe for everything from Biros to mobile phones.